The Cleveland sales district created a regional special promotion edition 1969 Mustang (and Torinos) called The Going Thing. 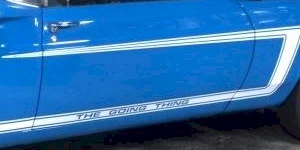 109 Mustangs had special stripes installed with "The Going Thing" written on the rocker. They were installed on stock Mustangs with all sorts of engine sizes. The stripes were similar to those on factory Ford drag cars. The promotion was kicked off at the Thompson Drag Raceway in Thompson, Ohio. This Ford photo shows the Cobra Jet Mustangs and Torinos of the Ford Drag Team from the Summer 1969 edition of the Ford Truck Times. Featured drivers are Hubert Platt and Randy Payne in the eastern United States (blue cars), and Ed Terry and Richard Wood in the west (white cars). These performance cars inspired the 1969 The Going Thing special edition Mustang.